Achieve soft, glowing skin with this money-saving package. Luxurious Lotus Touch Citrus Body Polish features an active moisturizer base that is easily absorbed by the skin. The fine, apricot kernel exfoliant can be removed with warm, moist towels. 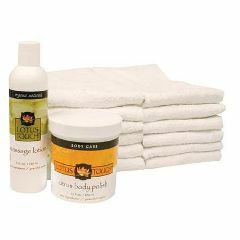 Finish the treatment with a light massage using Lotus Touch Organic Naturals Massage Lotion.